Home PROFILES What’s Next for Naked? “More” answers Justin Davis-Rice with a hint of what may or may not be a smile. For the new CEO of Naked Brand Group, that could be only a slight exaggeration. Davis-Rice readily admits that, while his company already has a global footprint, it has even greater aspirations. Naked’s ambitions seem based on a solid foundation. For with the merger of U.S. fashion and lifestyle company Naked Brand and New Zealand-based intimate apparel maker Bendon, Ltd., the company has transformed itself into a force to be reckoned with in the world of underwear. Learn More About NAKD at your brokerage today! 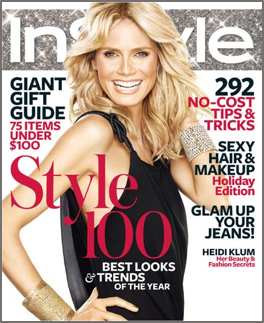 Its products, including such iconic brands as Heidi Klum Intimates, Lovable and Naked, are now sold in 44 countries through more than 6,000 retail locations – including Bloomingdales, Nordstrom, Saks Fifth Avenue, Harrods and Selfridges – and are marketed to an even greater global market via the Internet. One result of the merger is an even bigger runway for supermodel Heidi Klum and the lingerie and swimwear brands that bear her name. Ms. Klum has been associated with merger partner Bendon since 2014 and serves as the creative director her namesake collection – which, happens to be the top performing brand in the company. But the merger means more than new brands and a celebrity spokesperson. Among other things, it means that Naked has the potential ability to utilize the financial markets to expand its distribution networks and potentially acquire more brands. Davis-Rice believes Naked has plenty of room to grow. According to the CEO, the company’s retail platform is capable of supporting approximately $200 million in revenue with a relatively minimal increase in general and administrative expenses. Or, in other words, without breaking a sweat. Is Underwear Due for a Change? According to some observers, that change is overdue. Once dominated by a few famous brands, the industry has been roiled by upstarts. Some experts view the category ripe for consolidation. And with its global presence, iconic brands, financing accessibility and industry-leading design and sourcing platforms, many believe Naked could very well be the company to make that happen. It would be worth Naked’s efforts. According to Allied Market Research, the intimate wear market is expected to generate $250 billion by 2022. One reason for that growth, as Davis-Rice points out, is that customers are not only purchasing more underwear, they’re spending more for it. This strong consumer demand is leading to unprecedented growth for the category. Another highly significant change in the intimate industry has been the shift to a direct-to-consumer model thanks to the Internet. Apparently, women don’t like shopping in those stores, either. Most intimate apparel shoppers on the Internet are women, according to industry research. At Naked, E-commerce sales have grown from 4% in FY2015 to 25% of net sales in FY2018. But the company believes there’s more where those sales came from. 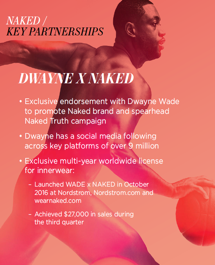 Naked has indicated to be readying a major acquisition campaign – targeting companies that meet its criteria: a proven online strategy and strong brands in its product portfolio. Naked’s emphasis on e-commerce-savvy retailers would suggest that the company’s compass is pointing directly toward the Internet. But there’s more to the company’s strategy than that. Naked Brand Group’s global strategy is a thing of elegant simplicity – a strong e-commerce presence in the United States combined with robust multi-channel distribution around the world. An important part of that “robust multi-channel distribution” is Naked merger partner Bendon’s 61 company-owned retail and outlet stores in New Zealand and Australia. Bendon, founded in New Zealand, is as well-known down-under as Jockey® is in the United States. Will Naked Brand eventually dominate the intimate apparel industry? It’s entirely possible, many industry observers believe. Financial journalist Laura Hoy says that “because the two merger partners serve different markets, there’s a great deal of growth potential” for the combined companies. But Naked Brand’s leaders seem less concerned with dominating the industry than in creating shareholder value. And they see targeted growth as key to that. All of which makes Naked Brand Group, in this writer’s opinion, not only a company to watch but one that presents investors with “more” opportunity.